Being a Foreign Service Officer means representing the United States abroad for diplomatic purposes. But Anne Claire Andaya-Nauts (M.A. ’06) knows it’s much more than that. 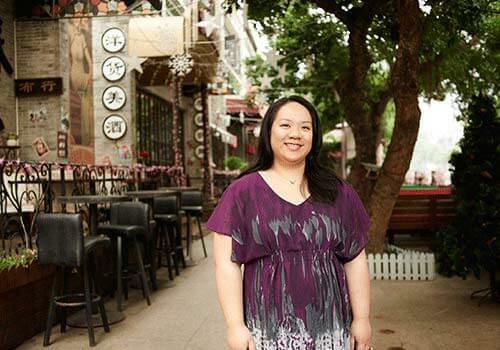 Today, Andaya-Nauts is the Vice Consul at the U.S. Consulate General in Guangzhou, China, a city of 8 million people. “When doing visa interviews, I may be the first American an applicant has ever met, and I want to make sure that I represent my country well,” said Andaya-Nauts. Her first Foreign Service assignment was in Chennai, India, an experience that challenged her to learn a new language and to be flexible at all times. She and her husband, along with their three young children, know well what it’s like to be an American living in a foreign country, which makes assisting other Americans abroad one of the most rewarding parts of Andaya-Nauts’ job. The consulate’s American Citizen Services unit helps Americans abroad with a variety of situations, from reporting lost passports to completing paperwork for American babies born abroad. Andaya-Nauts first considered joining the Foreign Service as a high school student, in part because living overseas sounded exciting. And it is. She knows that as a Foreign Service Officer, she could end up just about anywhere.